Welcome to RiverView Miniature Horse Stud. 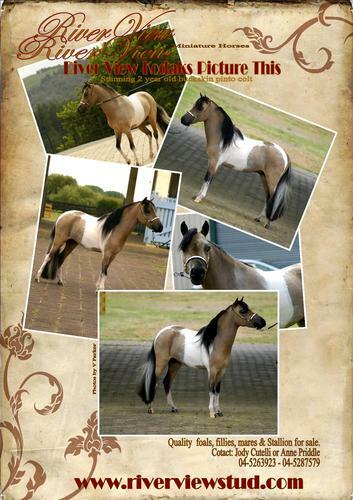 Our aim at RiverView is to breed quality horses with the best possible conformation adding style and elegance to the whole package with the bonus of beautiful heads, refined modern body type & a rainbow of colours. Going by the results we feel we are on the right path with a mix of the best home grown & imported bloodlines. As we are only breeding up to five foals a year our plan is to keep to a boutique style stud with the careful selection of each mare to our stallions. Enjoy our site, you are more than welcome to viste our stud or contact us. We have 5 mares in foal to multi supreme staion Bluegables Aloha Maverick, as a foal Maverick was NZMHA res National grand Champion horse cat A as a 2 year old he won NZMHA Grand Champion Junior stallion B. He is very fine leggy Lad with the pretty dishy head and we look forward to seeing his babies. River View Kodaks Picture This. 2 Year old colt.